e8Viewer.nbp e8Viewer.nbp - e8 particle viewer This is based on A Garrett Lisi's e8 AESToE model plus my ToE mass/lifetime formula calculations. This is a Mathematica Notebook Player file and can be played on the free Mathematica player from www.wolfram.com. e8Flyer.nbp e8Flyer.nbp - same as the viewer but with added controls to manipulate a flight around the 8D particle configuration space projected onto 2D or 3D space. This theory is based on (multiple, varying) fundamental Universal Constants linked to Time. 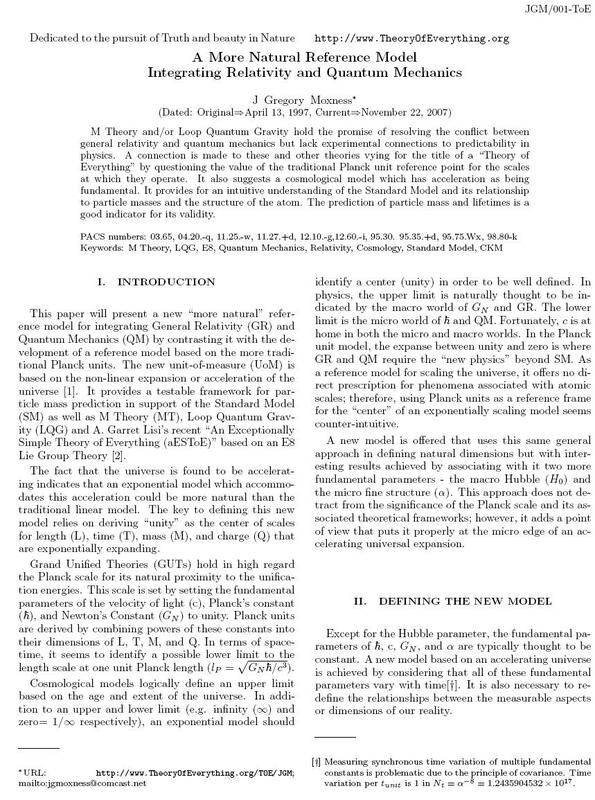 It begins with the current and most precise experimental data, the Standard Model (SM), and General Relativity's (GR) expanding (accelerating) Space-Time. The standard GR definition of time in the context of physics is “the distance between events”. As such, it equates t=l or more properly t=l/c where c=DimensionessUnity for so called ‘Natural Units’. An extension of this idea is offered based on the fact that the universe is found to be not only following a Hubble expansion, it has been found to be accelerating. 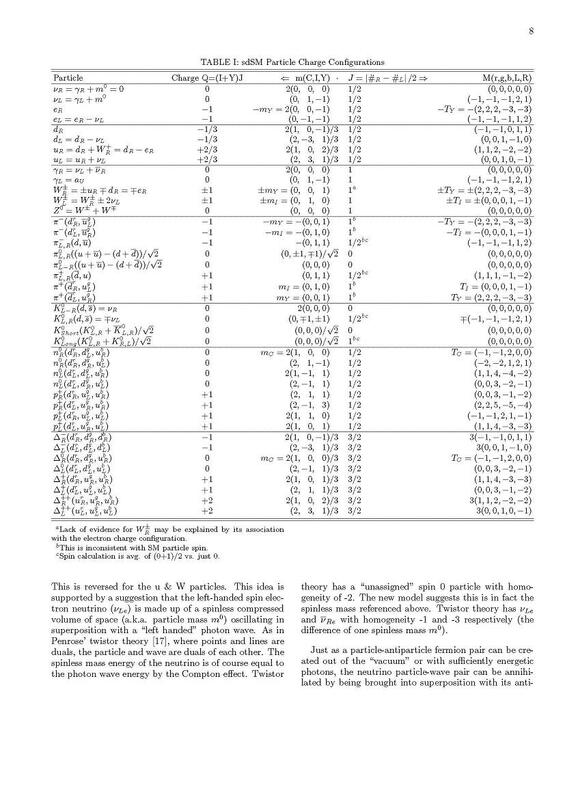 This provides an opportunity to propose a “more natural” Units of Measure (UoM) by extending Planck Units that accounts for this acceleration by normalizing the fundamental universal constants to that acceleration. Consider this normalization to be a kind of “Meta-Relativity”. It associates the fundamental universal constants to time. This clearly implies an acceleration due to an ever increasing velocity of light. The previously presumed “short inflationary period” soon after the big bang is now shown to be a natural and ongoing part of the process of the normal accelerating expansion of the universe. The obvious question of the source of this acceleration can be addressed by the fact that acceleration is dimensionless (l=t^2, so l/t^2 is dimensionless-- just as in 'Natural Units' l=t, so v is dimensionless). In the context of Meta-Relativity, this can be viewed as the “Meta-Inertial Reference Frame of Meta-Relativity". The source of the acceleration is the creation of particles of matter in quantum fluctuations and the Big Bang. 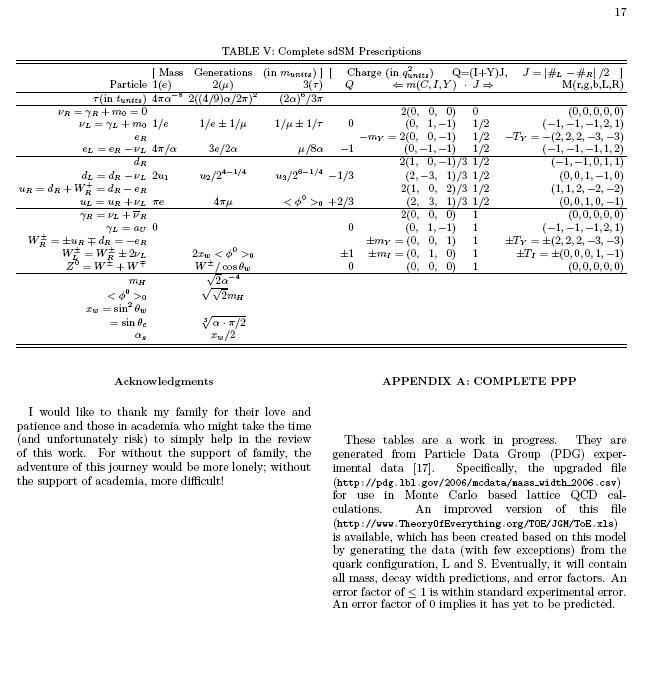 A natural conjecture for a prescription of the mass of the Higgs boson (148 GeV) is given based on using Higgs mass to define the charge of the electron (e). It is also interesting that with a natural explanation for Dark Energy=2/3, a precise calculation for the age of the universe based on the measured value of fine structure is found to be 13,857,928,235.3 +/-9.7 years.